All disputes to be arising from transactions, purchases and contracts with Ideal Envelopes Limited and any of its sister web sites or associated companies shall be determined and governed by English Law. All goods and products remain the sole property of Ideal Envelopes Limited until paid for in full. Orders placed with Ideal Envelopes Limited shall not be binding unless Ideal Envelopes Limited accepts them. Whilst every effort will be made to effect deliveries and maintain prices quoted, Ideal Envelopes Limited has the sole right to vary prices and deliveries. Ideal Envelopes Limited have the right to delay or cancel delivery. Deliveries, under normal circumstances, are dispatched within 1 - 3 days. If there is a problem with any part of an order we will try to let our customers know, either by telephone or email. We can only dispatch to a full postal address. No PO Boxes or Mail Boxes please. Please note:- All deliveries from Ideal Envelopes / PaperCard must be signed for upon receipt. Only applies to orders placed on a single website within the IEL network. To obtain free delivery the single order must be over £75.00 (Ex VAT). Free delivery will not apply to combinations of orders placed on a single website or combinations of orders placed on multiple IEL network sites. No exceptions will be made. This pricing structure applies to parcels under 20kg in weight. Any order weighing over the 20kg benchmark will be quoted upon accordingly. All items are dispatched by our private carrier DPD and will therefore require a signature. You will receive a one hour delivery window by either text or email. If the delivery date/time is not convenient, you can reply to the text or email to re-arrange the delivery date or give instructions to leave it with a neighbour. You can find more information on this service by clicking here. If no-one is available to sign for the parcel, it will be returned to our Carriers Depot and a calling card will be left by the carrier with a contact telephone number for your local depot, for you to rearrange delivery or collect the parcel personally from the Carriers Depot. If uncollected after 3 days the parcel/parcels will be returned to us. The customer will incur the costs of the return delivery charge to our Sheffield warehouse and it will be up to you to contact us to arrange for re-delivery (for which you will have to pay the postage costs again). No exceptions will be made, please ensure you provide us with a delivery address which has someone available to accept delivery throughout the day. By placing an order with Ideal Envelopes Limited you agree to these conditions. Postage is extra to the Rep. of Ireland, Northern Ireland, Isle of Man, Isle of Wight, Scottish Isles and some Aberdeen postcodes. Orders for these locations should be submitted for a full quote. We reserve the right to revise the postage charges, if this is necessary. We will contact you with the quotation before your order is processed. Delivery to these postcodes may take a little longer to reach you. VAT is a tax on goods and services, therefore if the goods that are dispatched to you are vat-able then so becomes the service of dispatching the goods to our customers. Visa Credit/Debit, Mastercard, Visa Electron, Solo, Maestro, American Express and PayPal. If you find some/all of your items are faulty/damaged, please make sure you let us know within 7 days of delivery, otherwise this cannot be rectified later. No exceptions will be made. Card blanks, cut paper and card including A5, A3 and 300mm square sizes are bespoke made and cut for customer orders. These are none refundable and non returnable. You can request a sample before hand to make sure the card or paper is correct for purpose and use. Paper and card is cut to + and - 1 mm tolerance. Pre-printed envelopes or custom printed envelopes are a none refundable and non returnable item. We recommend requesting a sample before placing an order. The onus and responsibility is with the customer to ensure the goods are returned in a proper and resale able condition. Damage incurred to goods by customers carriers, will be the customer responsibility and no refund will be issued. Items from orders must be returned in full, we cannot accept part pack returns. Bespoke quotations requested by customers and supplied by Ideal Envelopes or any of it's associated companies are binding and goods are non returnable. By placing the order for the bespoke quotation you accept these conditions. This applies to all items included in your quotation, bespoke and stock. Items returned in an unfit and un-resaleable condition will be disposed of at Ideal Envelopes discretion. Photographic evidence will taken. Ideal Envelopes will not return the damaged or unfit goods. Coupon Codes must be used at the time of placing your order online, refunds will not be given after an order is placed. Instructions on how to use coupon codes are given in bold on the sample request page at the time of requesting samples. Sample request coupons cannot be used when other offers are available on our web sites ie. Discount Weekends. Sample request coupons are valid for 3 months. No Exceptions will be made. Discount weekends or any other special discount offers do not apply to the following categories: Deal of the month, special offers, sample swatches, sample request, clearance corner and any other already discounted products. Under UK law you are entitled to a "cooling off" period after placing your order. You may cancel your order without giving a reason and return your goods within 7 working days of receiving the goods. Customers will receive a full refund of all charges other than postage. Goods must be returned as new and unused. Where goods are supplied in sealed packs or containers, the packs or containers must be unopened. This does not apply to bespoke made items. Items that are non-standard stock (which are sent directly from our supplier to the customer) are also non-refundable. No exceptions will be made. Coloured envelopes, card & paper by their nature have a tendency to fade, some colours more than others and in particular recycled papers. It is important when storing or displaying envelopes, card & paper to avoid direct exposure to sun light or bright lighting systems. Colours may be subject to change. 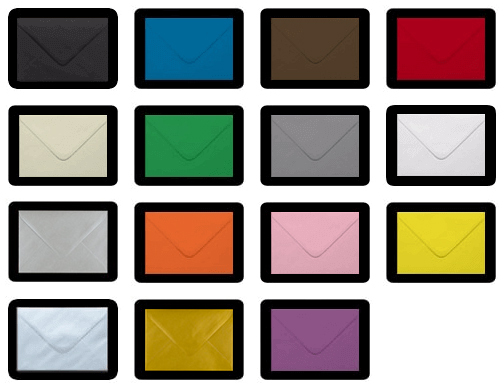 Pearlescent papers, card and envelopes do have a tendency to vary from batch to batch. We have no control over this manufacturing process. 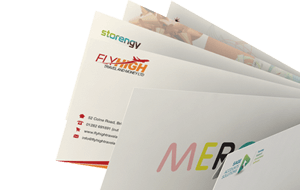 Our pre-printed or custom printed envelopes are a bespoke item and cannot be returned. We may take a photograph of your printed envelope to use in our printed envelopes gallery or social media. We will in no way re-use or sell your artwork to any customer/third party. If you would not like us to do this for showcasing then please contact us. By ordering from this website you automatically agree to these terms, if you are in any doubt about your rights please contact us before placing your order. A written copy of our terms and conditions is available to any customer free of charge to a UK postcode.